Atheros announced its 2010 family of three-stream, high-data-rate and rate-over-range chips: The AR9300 XSPAN line up has a three-stream, 3x3 format for up to 450 Mbps raw (300 Mbps TCP/IP) 802.11n traffic. But speed is critical only at close distances: the chips have been designed to keep data rates high as devices move further and further from an access point. Pen Li, senior product marketing manager at Atheros, explained that the company's goal with what it's calling SST3 technology is to "maintain signal reliability across the entire link." To that end, it's employing four features. At short ranges, maximum likelihood demodulation (MLD) employs a massive amount of calculation to figure out the best of a matrix of potential encoding systems to use. Li said this could effectively increase antenna gain by 6 dB over the current technique. "Up to this point, the industry has been using this sub-optimal scheme called zero forcing." That was because the necessary CPU cycles weren't available in earlier generations. Atheros says this extends higher rates (up to 200 Mbps of TCP/IP throughput) 100 percent further than current tech. This transmit beamforming boost keeps rates higher--at around the 100 Mbps TCP/IP data rate--50 percent further. For the longest distances, Atheros will use maximal ratio combining (MRC), which uses some magic to pull signals from different paths, relying on a certain amount of redundancy, to push range by 20 percent further than current systems. MRC in a more limited form was used in Atheros's SST technology. With a 3x3 antenna matrix, it can be used to greater advantage. Across all three methods, Atheros will use low density parity check (LDPC), a binary forward error correction with very low overhead to reduce error rates. Forward error correction encodes additional data to allow a receiver to fix errant bits without asking for a packet retransmission. Atheros is pusing this chip line-up as its flagship brand, with suggestions for applications for home and mobile computing (better range), media (set-top boxes, gaming, multiple HD streams), and business (better performance in dense environments or less expensive deployments with fewer APs). The chips are slated to be sampled in the first quarter of 2010. Atheros didn't offer guidance about when its OEM partners would have products available based on the designs, but it's likely by the end of 2010 at least consumer devices would appear. While three-stream devices are already on the market, there's only one piece of client hardware for laptops, meaning that only range and reliability can be improved with a three-stream device, not throughput. Qualcomm says it has 600 Mbps 802.11n 4x4 solution: The cellular and GPS chipmaking giant finally releases new Wi-Fi gear, blowing the roof off with a 600 Mpbs (raw), 4-radio, dual-band, 4x4 antenna array--the N-Stream Wireless LAN WCN1320. The chip will sample this month, allowing manufacturing partners to start designing products around it. A production date isn't announced. Ever since the grand compromise was made that allowed Task Group N in the IEEE 802.11 Working Group to move forward, the option of having four radios and a 4x4 antenna array for a raw data rate of about 600 Mbps has existed. However, the cost of such a device would be so high that until 2-radio (raw 300 Mbps) 802.11n was in wide use--especially in enterprises--the 4-radio flavor didn't seem to be something the market would demand and pay a huge premium for. 1 1/2 to 2 1/2 years into the N revolution, depending on how you count, the time must be ripe. Qualcomm is advertising this product as a way to carry multiple HD streams across a house. The chip integrates an application processor, which allows a set-top box or other equipment maker to offload some processing to the chip instead of adding an additional burden. Qualcomm acquired the pioneering MIMO Wi-Fi firm Airgo a couple of years ago, and this is the first standalone Wi-Fi product that's emerged from the firm since then. The company isn't the first to announce a 4-radio 802.11n solution. The startup firm Quantenna announced a 4-radio, 4x4 antenna chip that it could configure in a pair for what they say would be an aggregate of 1 Gbps across 2.4 and 5 GHz. As far as I can tell, Quantenna is sampling, but no products are yet shipping. Atheros thinks single-stream 802.11n has potential to replace 802.11g: Atheros has introduced the Align, a family of chips that use a single antenna to bring some 802.11n advantages without the spatial multiplexing, improved receive sensitivity, further transmit range, or antenna diversity, among other characteristics. The company told EE Times that they wanted to get beyond 802.11g for future devices to bring the advantages of newer designs. This should allow G prices with some improved N features. This won't break 802.11n compatibility, as 802.11n can hear a single spatial stream just as well as it can multiple ones. In fact, 802.11n provides the flexibility to have multiple streams sending the same data redundantly, which is what Quantenna has opted to do with its consumer gear--sacrificing raw speed for resilient performance. Atheros is claiming 50 Mbps in TCP throughput with 20 MHz channels and 107 Mbps with 40 MHz. This isn't out of line with the base raw symbol rates in 802.11n (65 Mbps instead of 54 Mbps). TCP throughput still has overhead, of course, so it's likely that single-channel N will be about twice as fast as the 20 Mbps or so 802.11g could achieve. Atheros has released an open-source version of the driver software that talks directly to its chips: The company has long maintained that it required a closed HAL (hardware abstraction layer) to prevent rogue developers from changing settings in its Wi-Fi chips that would cause the chips to perform activities that were against its interest. For instance, it's a/b/g chips can use the 4.9 GHz band, which is illegal in the U.S. and many other countries, but allowed in Japan. Those objections must have been overcome, as the firm is providing a full, ISC-licensed free software code base for their HAL for 802.11a/b/g chipsets. This should allow the ath5k project to create a fully Linux kernel integrated driver for Atheros chips with no reverse engineering or licensing issues. This opening up of the HAL allows laptops and handhelds running versions of Linux to have more effective use of the Wi-Fi adapters built in or that can be added on. Note that Atheros hasn't opened up its 802.11n chips yet. The U.S. International Trade Commission bars imports of newer handsets containing Qualcomm 3G cell data chips: This ban stems from a patent dispute with Broadcom, in which the commission found that Qualcomm infringed on Broadcom patents. Handset models previously imported may continue to be brought into the country from overseas manufacture. However, no chips or modules containing these chips, nor any device released after June 7 that contains Qualcomm chips may be imported. Qualcomm also must halt some domestic activities, too. While Qualcomm has little impact currently on the Wi-Fi market, they have patents and technology that cover all major third-generation (3G) cell phones data networks and handsets. Disputes have arisen in the US and Europe over Qualcomm's extent of claims of what technology they control through patents, and their licensing fees. Broadcom and a number of handset makers have a variety of lawsuits against Qualcomm and Qualcomm against them. Qualcomm purchased Wi-Fi chipmaker Airgo, the earliest mass developer of multiple-in, multiple-out (MIMO) antenna technology to supplement 802.11 specifications; and has staked out contrary positions around mobile WiMax, initially completely opposed to it and waging a propaganda war against it, and later purchasing a firm that had WiMax equipment in its portfolio. President Bush can overturn this order. Atheros designs Bluetooth chip aimed at PCs: Most Bluetooth chips used in computers are repurposed from mobile applications, Atheros claims. Their new product is more efficiently designed with a lower cost of goods and integrated flash memory. Also features the Solid Gold Dancers: Broadcom said that they will offer a single chip with Bluetooth, Wi-Fi, and FM radios on board. The chip uses a 65-nanometer (nm) CMOS process, which means its circuits are tightly packed using the most common manufacturing techniques. Size has a relationship to power requirements. The Wi-Fi is a/b/g; the Bluetooth 2.0+EDR with 2.1 upgrades possible. Update: CSR on Feb. 7 also announced a Wi-Fi, Bluetooth, and FM converged chip platform. The company released specific throughput figures, rare in the industry, noting that Wi-Fi by itself could achieve 23 Mbps in their chip designs, and Wi-Fi and Bluetooth together using "collision detection logic" would drop Wi-Fi down to 18 Mbps of net throughput. On Feb. 7, Texas Instruments also announced a triple-threat, this time with 802.11n. Swing the noisemakers, folks: Yes, this is just a typical industry press release. But it's also a good milestone to mark. Broadcom was the first company to ship production 802.11g in advance of the ratification of that standard, and has now shipped 100m 802.11g chipsets. With that mark in mind, it's likely that we must be over 500m 802.11 chipsets of all kinds from all vendors. 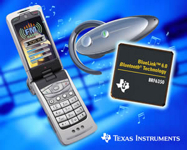 Texas Instruments introduces a Bluetooth chip that rocks, dude! Its BlueLink 6.0 platform couples FM radio reception (mono and stereo) with Bluetooth in a single chip. This module also co-exists neatly with Wi-Fi. The notion is that a handset could be an FM tuner without additional chips or integration; this feature must be a top request as music players are added into phones. One analyst predicts 400m units with FM reception by the end of the decade. Of course, if I put on my other hat, I know that HD Radio, a digitally encoded form of AM and FM radio, has begun making headway in the market. HD Radio uses unused guard bands around the primary analog frequencies to deliver crisp, even multi-channel audio. It makes a lot of sense in about two years to have HD Radio-only AM and FM tuners in handsets. About 700 stations broadcast HD Radio today and only a few car receivers, one high-end home receiver, and one tabletop radio can tune in these broadcasts. A few thousand stations will have added HD by 2007. The platform works with all common cell phone standards (2G through 3G), as well as Linux, Microsoft, and Symbian operating systems. The chips in two modules are in sampling with devices expected in early 2007 based on the technology. It's not as big a move as IBM/Freescale to Intel, but it's a shift, nonetheless: Broadcom scored an early trifecta with 802.11g back in late 2002 and early 2003 by signing Apple, Belkin, and Linksys for a round of 802.11g-based products. They also swept in Buffalo and several other firms (notably missing D-Link and NetGear) in that heady run-up to 802.11g ratification. In the latest Apple products, the first to be based on Intel processors using the Core Duo chips, sources outside of Apple told me that Atheros chips have been incorporated: it's true, but Broadcom hasn't been abandoned. Both Atheros and Broadcom chips are specified in Apple documents and are shown in FCC filings. It's not odd that with a new system architecture Apple would have reviewed chip suppliers, and they may have chosen to work with both Broadcom and Atheros to have competition for their business. There's a limited number of PCI Express-based Wi-Fi chips, which is what the internal, included AirPort Express hardware uses. The MacBook Pro (the PowerBook replacement) and the Intel-based iMac support 802.11a for the first time, as well. Apple isn't emphasizing the 802.11a inclusion, and the technical specifications only say "802.11g standard." Although Steve Jobs declared 802.11a "dead" back in Jan. 2003, it was clear he thought it was a non-starter in the consumer market, and the enterprise was far from a win. In Jan. 2006, 802.11a's place as a larger spectrum swath without legacy slower equipment as a way to run more dense, faster enterprise networks and handle campus-wide VoIP is pretty clear. Apple adding 802.11a lets them sell more easily into enterprises and academia that are adopting 802.11a. One rumor cited by AppleInsider is that the demonstration of the MacBook Pro's built-in iSight video camera was carried over 802.11a to avoid conflicting with the many ad hoc 802.11b networks running at the keynote venue. Broadcom has declined so far to provide any non-licensed access to its Wi-Fi chips: A project that has been working to reverse engineer access using legal means has released its first working drivers for Broadcom 4300 series chips. The project requires the use of the SoftMAC software as well to compile working drivers within Linux. The first successful use was documented in email Dec. 4 to the developer's mailing sent from a PowerBook running Linux with the project's drivers installed. Atheros has allowed a third party to create a layer between the low-level functions of its chips and high-level drivers. The madwifi Hardware Abstraction Layer (HAL) prevents developers from having access to most of the radio functionality, which would might allow use of frequencies that aren't legal in particular countries, use of encodings that aren't allowed, and other regulatory problems. Atheros's latest Wi-Fi chip includes all 802.11g access point features in a single piece of silicon: They say it drops the component count 40 percent over its previous chipset. The cheaper ($12.50 each in quantity), smaller, and lower-powered these chips become, the more likely that APs shrink (they're still huge) or are found built-in to more equipment. The company is working with Spansion, a flash memory maker, to stack Wi-Fi components: The new approach of stacking components vertically could allow Wi-Fi to be a layer in a package containing memory, reducing power and space needs. Spansion is a venture of AMD and Fujitsu. The next-generation Intel chips will use less for more: This answers the conundrum posed by Apple's switch from Freescale/IBM chips to Intel, in which CEO Steve Jobs said Intel's roadmap offered dramatically improved wattage to computational power ratios. Next year's mobile processor will use one-third of its predecessor's power. Intel also said that it would work with Cisco to make better connections with the networking giant's access points, including using special sauce that would allow an adapter to connect to the most available AP by load (rather than the most opportunistically available), and handle VoWLAN connections more fluidly. Cisco and Intel will have to update respective systems. Reports are coming in from all over about Intel's breakthrough Wi-Fi chip design: But when you read a technical report, linked here, it's a not-yet-commercial design that simply demonstrates Intel's ability to incorporate 802.11a, b, g, and n within the same sort of flexible chip manufacturing process--CMOS--used for the largest wafer formats and highest yields. It's not that it's not interesting, but it's not yet a big deal given that 802.11n won't be finalized until what's looking like early 2007, and other chipsets already offer a/b/g in CMOS at low power. Atheros will ship a/b/g and b/g chips for PCI Express in third quarter: This next-generation bus design supports a much improved architecture for maximum throughput across all cards, and Broadcom and Atheros are both interested in being on top of its deployment. Atheros says that they have a single chip solution that integrates into a single-sided PCI Express card; sampling is already underway to its best customers. Broadcom announced in early April that they have a PCI Express chipset--ostensibly at least two chips--that's was in sampling then. I expect a war of the words over throughput, cost of goods, and other factors in the months ahead.